Hello there! My mind has been all over the place today. The main thing that's been on my mind is job hunting and careers. I've been thinking about what I want to do with my degree and what type of career I really want. As you can tell from previous posts, this has been on my mind for some time now. I know I would love to have my own business and I am working on my business plan, but I want to do something else while I'm working all of business plans out. So I guess you could say that the career I really want is to run my own business. Yea...I am being very complicated. You would think (or at least this is how I feel) that I would have been figured out for sure what it is that I truly want to do, but I find myself wanting to do way too many things. Here's to hoping that I can finally figure out what I want to do and quit being so indecisive. Hello there! 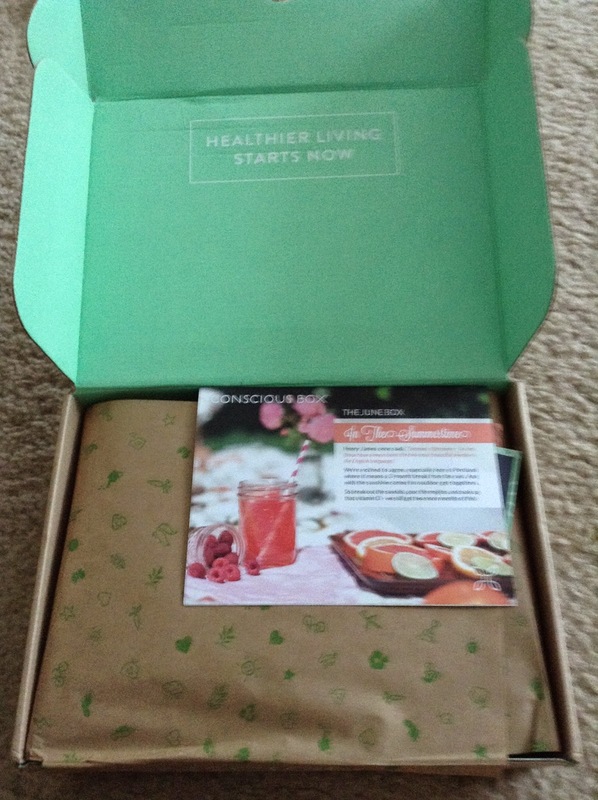 I'm super excited to share my review on the June 2014 Conscious Box! 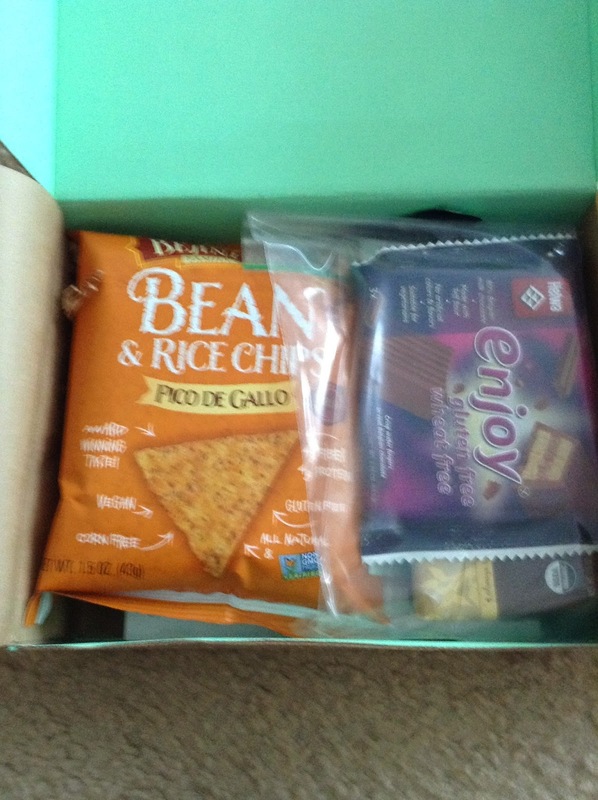 This is my last box from a 3 month subscription that I purchased on either Living Social, Groupon, or Plum District. However, Conscious Box is going to send me another box due to an issue with my second box which I thought was very nice of them. I'm going to make my final decision on whether to keep my subscription going with the final box since I'm still torn on whether or not to continue it. Here are some pictures of when i first opened the box and a picture of the card that comes in the box. The card tells you what it is in the box. One of the cards that I received in the box gives you some ideas on what to do with the chocolate bars that came in this month's box. One of the suggestions was to put the chocolates in the fridge since it may have melted a little. Surprisingly, my chocolate bars did not melt at all, but I still put them in the fridge. 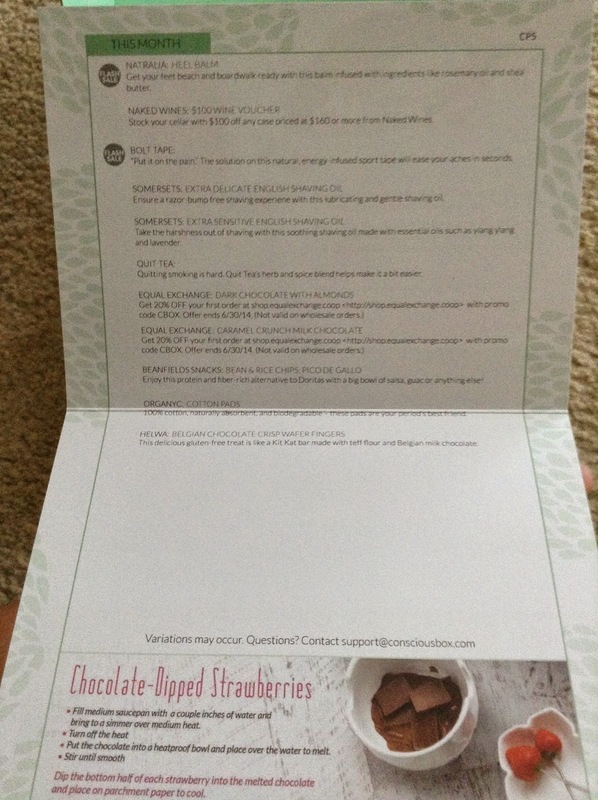 The other card was actually a mini booklet with recipes. These focused on the chips that were in the box. Loved that first look! Chips and chocolate...yay!! 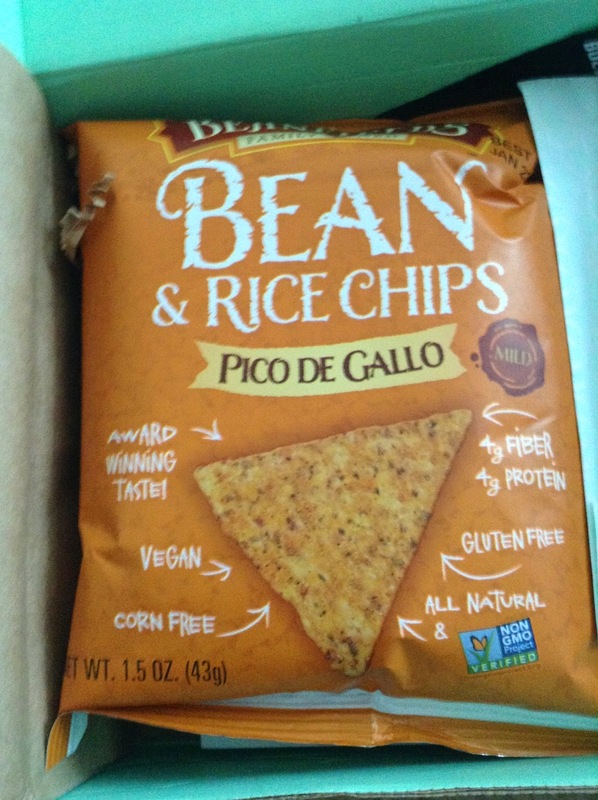 These chips have protein and fiber in them. They are also gluten free and corn free. I thought these were ok. I probably should have eaten these with some dip, but my oldest son loved these chips so I may purchase some more. I thought it was so smart of the people at Conscious Box to put the chocolate bars and wafers in a ziploc bag. Thanks Conscious Box! The wafer bars were delicious! I really, really loved them! They were like KitKat bars, but healthier! I definitely plan to purchase more of these. This balm has rosemary oil and shea butter in it. This may come in handy, but I may just put it in my travel bag along with the other lotion samples that I have received. 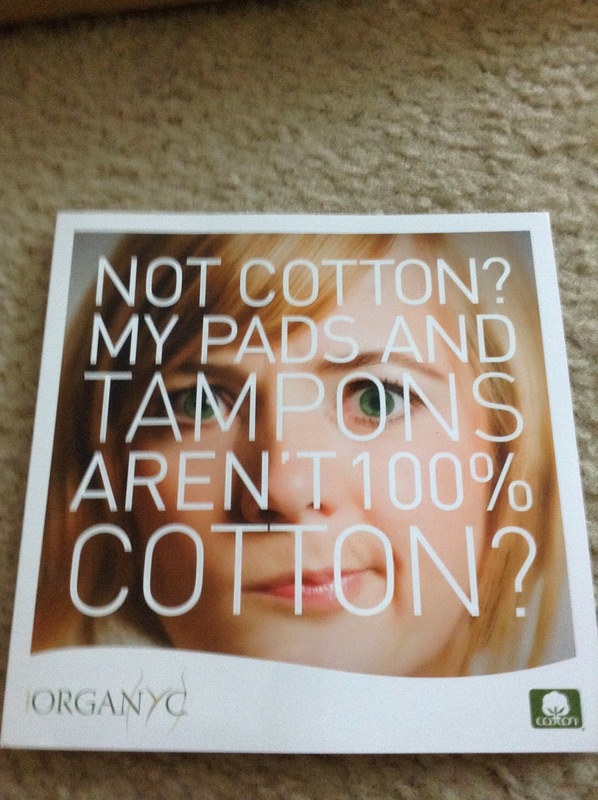 These pads are 100% cotton and are supposed to be naturally absorbent. Plus they are biodegradable which is awesome! 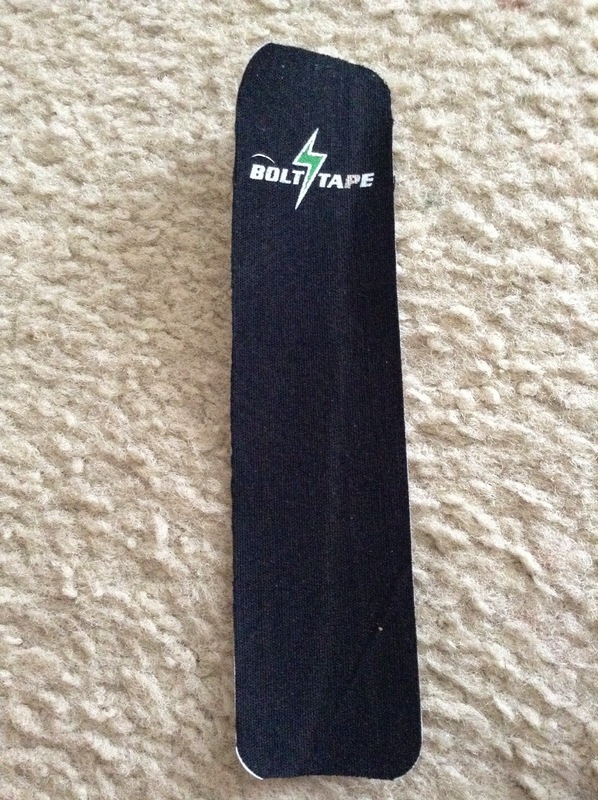 This is a natural, energy-infused sport tape that is supposed to ease aches very quickly. I hope it works and I know this will come in handy. 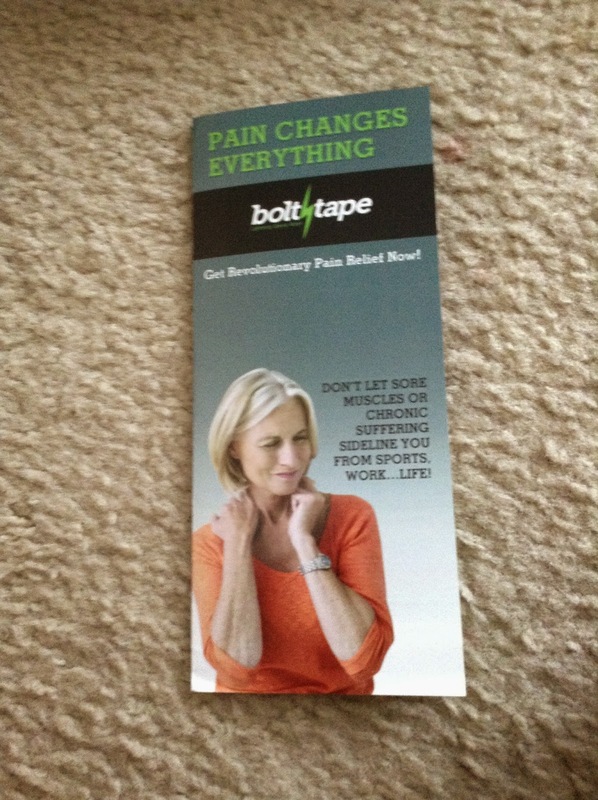 I received this pamphlet that has some more information on Bolt Tape. 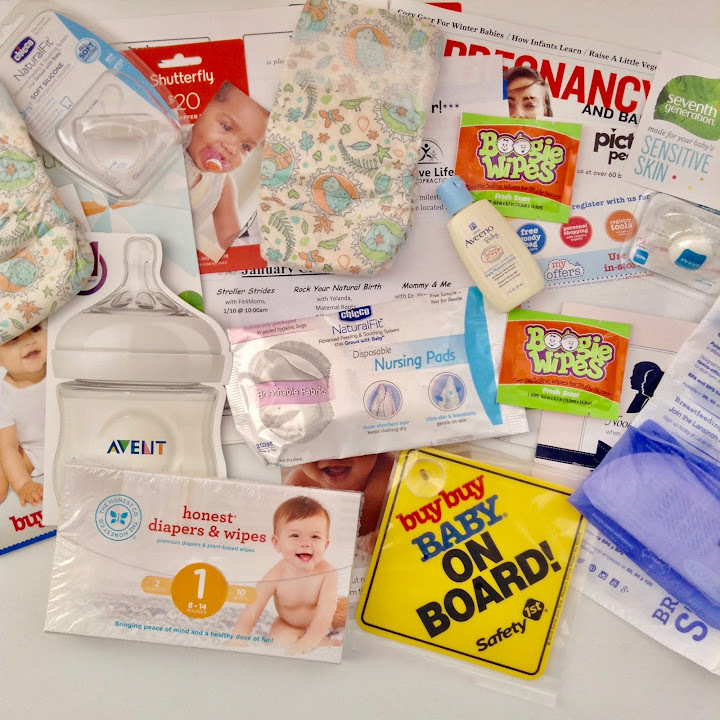 As always, Conscious Box sends some coupons with their subscription boxes. 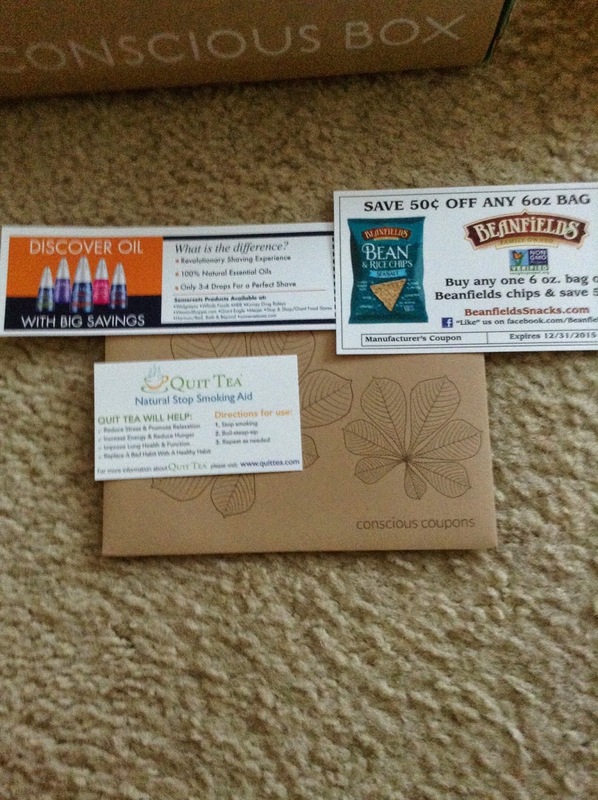 I received coupons for Beanfields, oil, and Quit Tea. 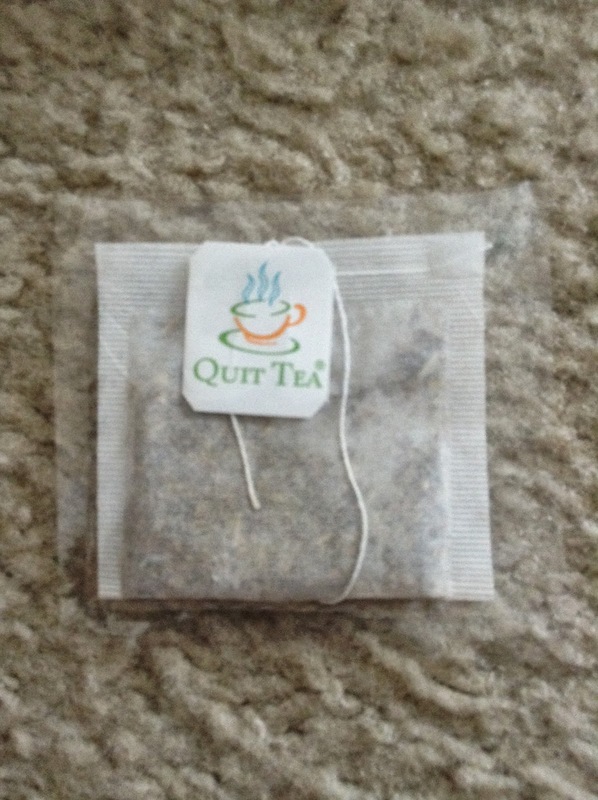 I will be giving the quit tea coupon away as well. 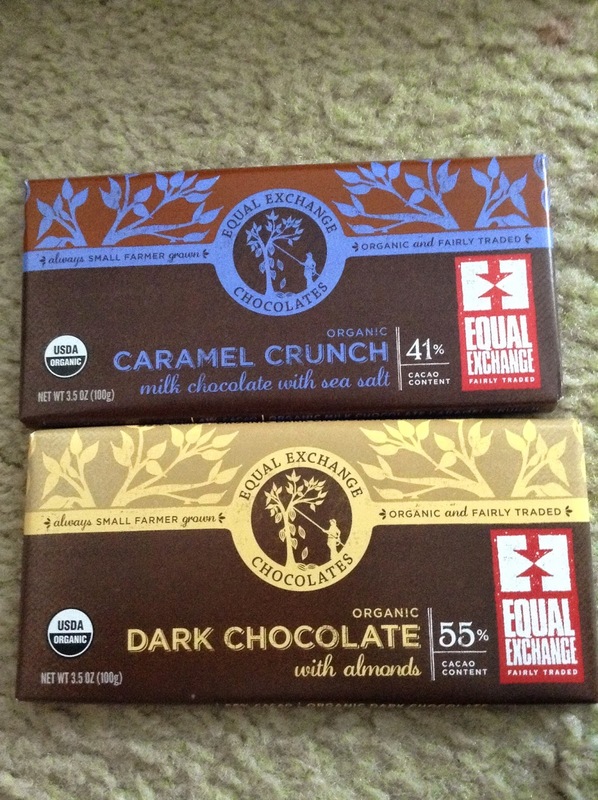 Oh I was super excited to get these chocolate bars! Surprisingly, I still have not eaten any of the chocolate bars! I think I'm going to melt one of the bars and dip some strawberries in them. The extra sensitive shaving oil is made with essential oils like ylang ylang and lavender. I assume the the extra delicate one has similar essential oils as well (don't quote me though). I think these may be useful. I have never used an oil before so I am curious if it works. 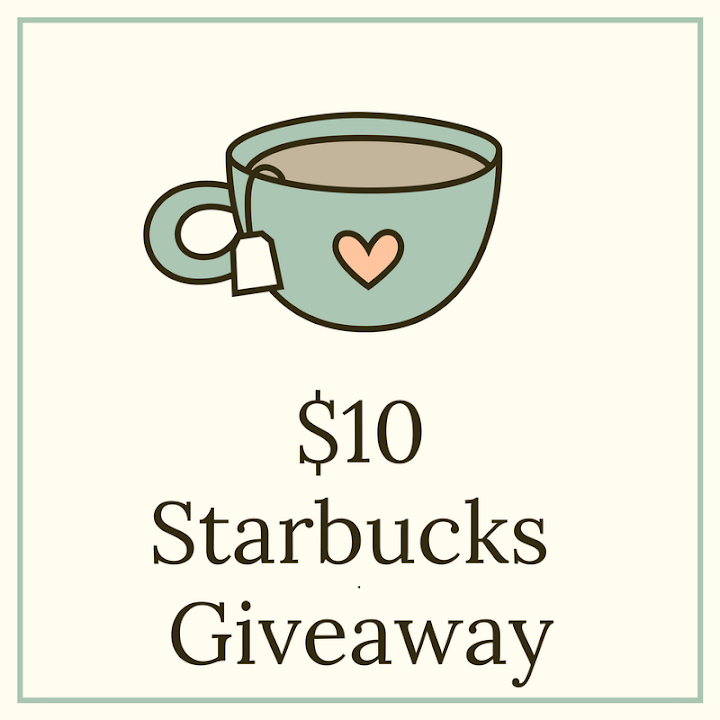 I will be giving this tea away. I do not smoke so I do not need this and I also do not like to drink tea. So that's my review. Overall, I was very pleased with this box. I am still considering extending my subscription, but I think I'll know for sure when I receive my final box. 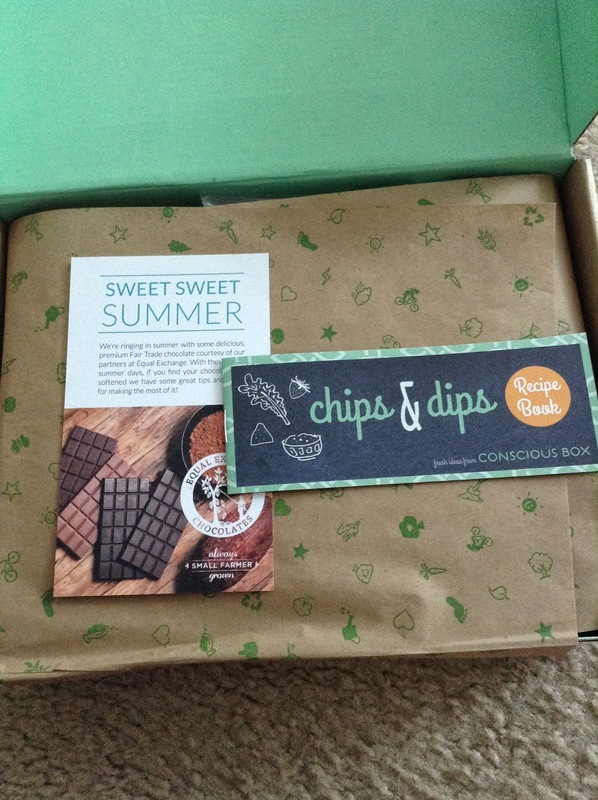 Do you subscribe to Conscious Box or a different subscription box company? Would love to hear your thoughts. Hello there! It's Thursday so that means it's time for another Thursday Thoughts! 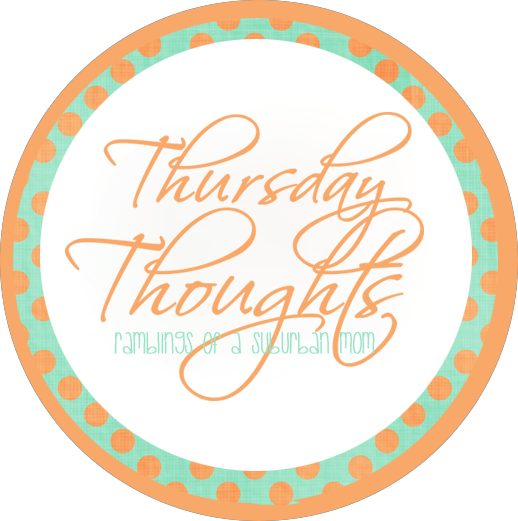 I first learned about Thursday Thoughts and the link-up from Jennifer over at Ramblings of a Suburban Mom. You can find more info about the link-up on her blog. I'm still figuring out what I want to do career wise. Has anyone ever been confused with what they want to do after graduating college? I think I know all the words to almost (if not all) of the Jake and the Never Land Pirates episodes. My boys are obsessed with that show. I'm loving all the shows that are now back on. Teen Wolf and Mistresses are back and I'm super happy about that. However, I am annoyed that Crisis was canceled. That show was so awesome. I think Dominion and the Last Ship are going to be pretty awesome and interesting. I'm going to try and meal plan a lot more. Hopefully the rest of this week and next week goes well. I'm in love with the song Cool Kids by Echosmith. I seriously need to start reading all of my stacks of books and my magazines, but I'm not sure which book I should read first. I swear I could open like a mini library at my place. I wonder how long I can hold out from ordering my Erin Condren life planner. My current EC planner doesn't end until December 2014, but I like to order it in advance. I need to look up reviews on the covers soon. I'm getting really, really, really excited for Fall. I've got so many plans for the Fall. I got my third Conscious Box...and I think it may have just been the best one yet. Plus they are also giving me an extra box due to an issue with the second box. I'm hoping to get my review done tomorrow. I'm excited that my Urthbox should be shipped in about five days. I can't wait to get the box and review it. We finally watched Frozen and it was a pretty good movie. I can see why so many people were/are obsessed with it. That's it for me today. How has your Thursday been? What are your Thursday Thoughts? Hello there! It's Tuesday and you know what that means...it's Currently List time. I love filling out these cards and use them in my Project Life album. However, they can be used in other projects like mini albums, traditional scrapbooking, etc. I still fill out a card weekly, but I've seen other people fill them out daily and monthly. Watching: I still love this novela. The finale is almost here and I will be sad when it ends. 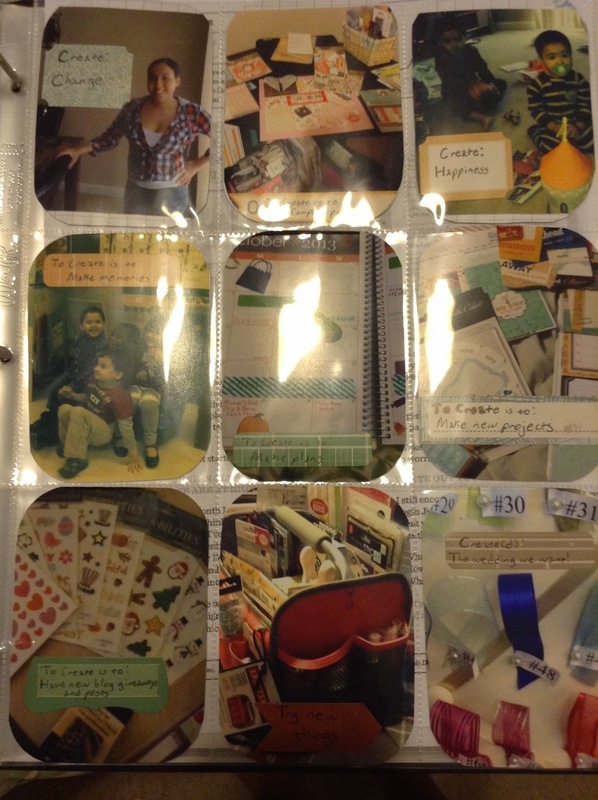 Reading: Someone on a Project Life Facebook page mentioned the Photo Pocket Scrapbooking magazine and recommended it. I actually found it at Michael's and bought. This is an awesome magazine and although it is a special issue, I would love if PaperCrafts & Scrapbooking made it a regular issue. Or if they made more issues that focuses on Project Life/photo pocket memory keeping. Listening: Shower by Becky G. This song makes me want to dance every time I hear it. My boys laugh at me when they see me dancing to this. Making: I'm going to be really busy until Wednesday so I want to do a lot of fun stuff (as well as make sure to relax) for the rest of the week. So I'm trying to make plans for the rest of the week. Feeling: I have been feeling really exhausted and sleepy lately. Some people have recommended taking Spark and Shakeology. I'm considering trying it too. So if any of you have tried it please let me know what you thought about it. 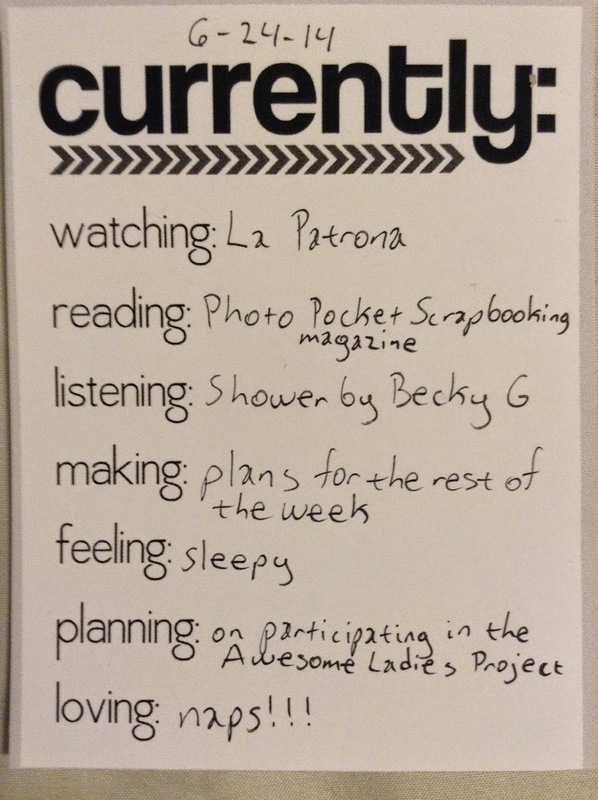 Planning: I have been wanting to participate in the Awesome Ladies Project. Now I know for sure I will have time to participate this Friday. I know (from my understanding) that you pledge two hours a month to creating something. Loving: Since I have been so exhausted and sleepy lately, I have been loving naps even more than usual. Hello everyone! Happy Sunday! I hope you have all had a great weekend. This year I am participating in Ali Edwards' One Little Word workshop. I have been a little behind on some of the prompts. However, I was able to catch up on all of the prompts. I only have to print out a picture of my vision board (March's prompt) and put it in my album. Then I can work on June's prompt. My word for 2014 is CREATE. I kept thinking about what word to choose and create just kept popping up in my head. 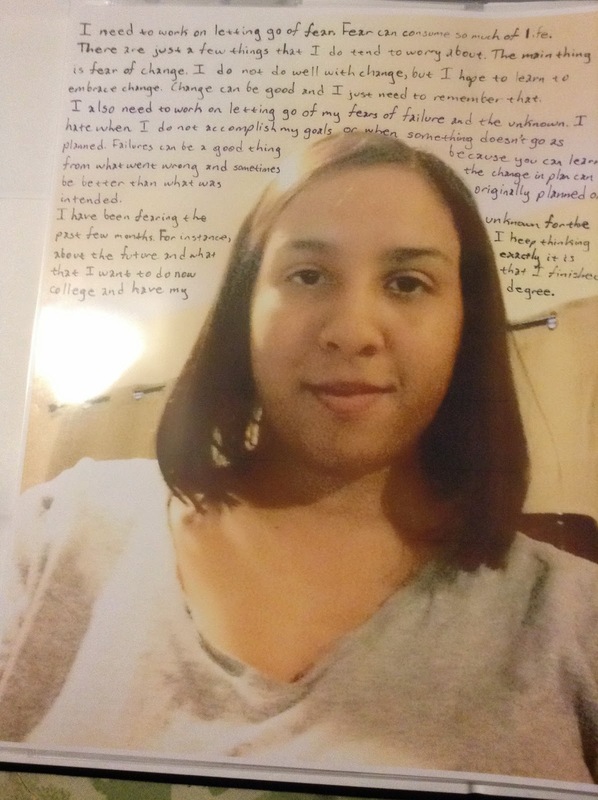 This is the vision board that I created. I believe that I may have posted about my vision board before (or I uploaded a picture of it). I love how it came it out and plan to frame it. One of my favorite things about my vision board is the card that I used. If you notice the card has a heart in the front and opens up. Inside the card I was able to put some words inside. I loved that the card gave me additional space on my vision board. The two pictures above are part of April's prompt. The smaller pictures have labels on them. I decided to reflect on some things from 2013 such as my wedding as well as focus on my goals for 2014. The large picture has journaling on it that explains what I am letting go. The main thing that I am letting go is fear. Everyone has a fear or two and a lot of times fear can hold us back. I am actually glad that this prompt was about letting go of something for the month. However, I decided to focus not only on the month, but for the whole year as well. The above picture is May's prompt. We were able to get artsy with this month's prompt. 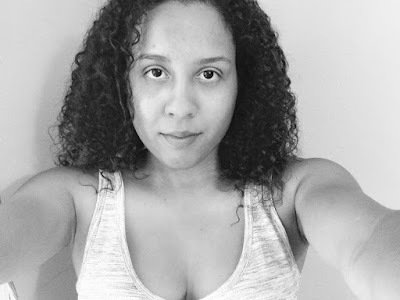 I followed the tutorial/experiment on Heather Greenwood's blog. I used gesso with most of the cards except for the middle card on the first row. I like how they came out especially since I was able to put alpha and word stickers as well as the little star embellishments. I still have a lot to work on with my word. Sometimes it can be hard to create things whether it is creating a project or not. However, I am up for the challenge and will continue to embrace everything that comes along with creating. That's all for tonight. Are you participating in Ali Edwards' workshop? If so how are you doing with your word? How are you doing with the prompts? Hello there! It's Thursday so I am going to post my Thursday Thoughts. I found out about this from Jennifer over at Ramblings of a Suburban Mom. You can find more information on Jennifer's blog. Even though I was disappointed that Bath and Body Works only have Dancing Waters online, I did go to the store to purchase some gifts. I even purchased a new set for myself that I hadn't tried before. I figured that I might as well since the annual sale is going on and there are some really good deals. I didn't get to watch Frozen last week or the other movies that we bought so I am hoping that tonight I can watch at least one, but I'll definitely watch one tomorrow. I think I am going to try and do a "No Spend" for July and August. Basically a "No Spend" is where you do not buy anything that you do not need (even if you really, really want it). Only necessities and bills will be paid. We'll see how that goes. We're pretty good at not purchasing things that we don't need so I don't think we'll struggle with this. I need to start reading all of my books and magazines. I think I mentioned this before, but I have a lot of books both in print and in digital format that I have yet to read. It is way too hot!! It's not even summer yet and the heat is just too much! I had a feeling this would happen since the winter we had was long and unusually cold. I'm becoming obsessed with mixed media. I'm going to try some more tutorials tomorrow and during the weekend. I'm hoping that the tutorials turn out alright. I can't wait to get my Conscious Box shipping link. I'm surprised that I haven't received it yet, but I already sent out an email. Well, that's it for me tonight. How was your day today? What are your Thursday Thoughts? Hello there! It's Tuesday and you know what that means...it's Currently List time! This is my 9th card that I am posting on my blog. I got the idea from Kristin over at Rukristin. You can check out her blog for some information. I just love that I can use the cards to write about what's currently going with me. Also you can choose to fill them out whenever you want. Some people fill them out daily, weekly, monthly, etc. I choose to fill them out weekly and put them in my Project Life album. Watching: Mistresses. This show is just awesome. I wish it was on every day. Reading: I've been catching up on reading some blog posts. Making: I need to catch up on my Project Life layouts. I am glad that I was able to start catching up today. I only have some journaling to get done so that's awesome! Feeling: I've been feeling a little stressed and I know it's because I try to do too much in so little time. One of my friends told me that I just need to space things out and take it easy. I really needed to hear those words. I always have to remind myself that, but it's different when someone else says it. Thanks Melissa! I'm taking your advice! Planning: I am planning to come up with some more blog posts. I'm ok with not posting every single day since you know...life happens and there will be times when I just can't post every day. I just want to make sure to post often. Loving: I love my new pairs of shorts and tops. I don't usually like wearing shorts, but it's a nice change from wearing my yoga pants or leggings and t-shirts. Hello there! First off, I'd like to say Happy Father's Day to all of the dads out there! I hope all of the dads out there have enjoyed their day. And a special Father's Day to my husband. The boys and I love you so very much! 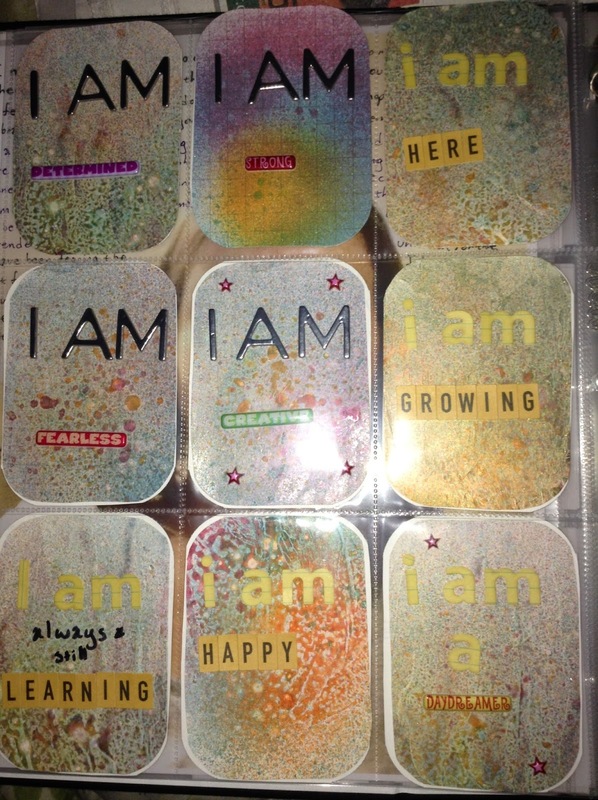 I finally got around to trying Heather Greenwood's misting experiment on Project Life cards. A few months ago, I bought a few of Heidi Swapp's color shine mists. 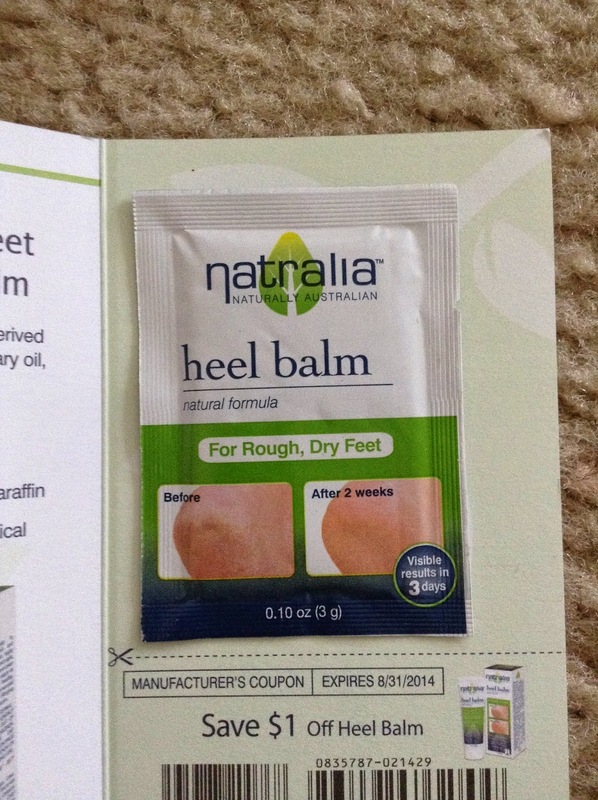 However, I never had time to try them out until I came upon a post that Heather made in a Facebook group. I used Project Life grid cards, Gesso, and Heidi Swapp color shine in teal, pink, and mustard. For the cards above, I only used the paper and sprayed the mist on them. I really like the card that is fully covered with the mist. The cards above have gesso on them. I spread the gesso on the cards and then started spraying mist on them. I think these came out ok considering that it was my first time even using mists, gesso, and a heat embossing tool. I actually made about 10-15 cards and realized that there are a few things that I can do differently next time. For instance, I now know that I should dry each color individually and that I should hold the heat embossing tool a little farther away. I planned to use the cards in my Project Life album, but now I think I'm going to use them in my One Little Word album. I definitely need to catch up on the prompts. 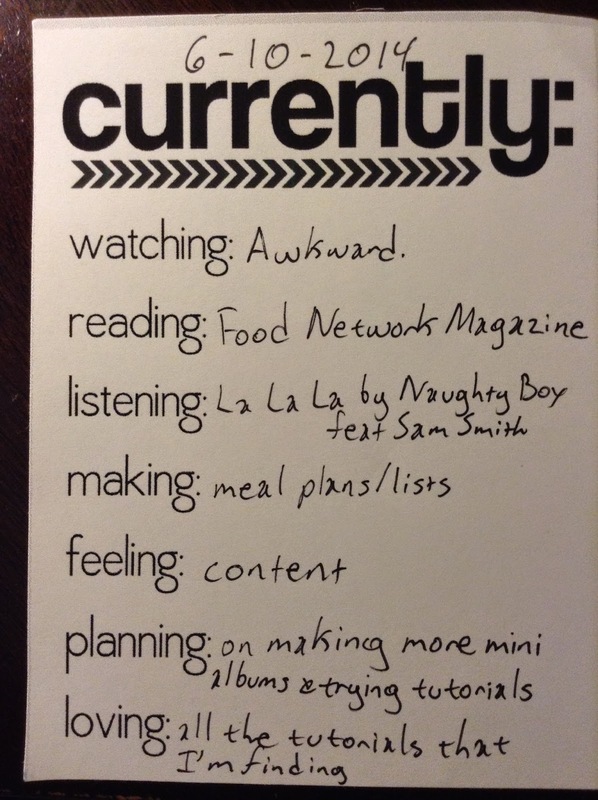 Last month's prompt was an artsy one and these cards will be perfect for the assignment. Let me know if you have ever done an experiment like this before. I'd love to hear how about other ways to get artsy with my Project Life cards. Hello there! Happy Thursday. I hope everyone has had a great day today. Today (I guess you could say tonight), I am going to be posting my Thursday Thoughts. 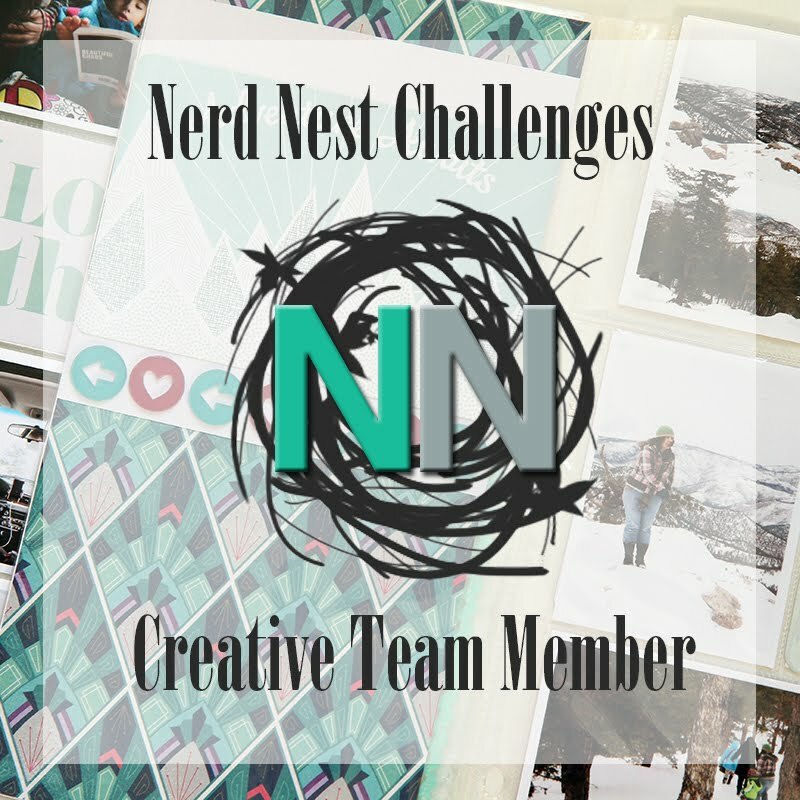 I got this idea from Jen over at Ramblings of a Suburban Mom and decided I would join the link up. Had a couple of errands today and finished the last of the cleaning except for the last load of laundry. I'm disappointed with Bath and Body Works. I was told that they do not carry the Dancing Waters body wash, body lotion, and spray except online. The cashier also told me that they only carry it in stores around the Fall/Winter semi annual sale. The Dancing Waters line is my absolute favorite so I will most likely have to just order it online. I went to Hobby Lobby and Michael's and got several supplies for the tutorials that I plan to try tomorrow and the next few days. You have seriously got check out Heather Greenwood's blog. The woman is just amazing! I think I'm going to finally watch Frozen tonight if I don't fall asleep. I'm seriously exhausted. I am so ready for Fall. It's one of my favorite seasons. I'm ready for the cool weather, Halloween (my favorite holiday), and Thanksgiving. I don't need to order my new Erin Condren life planner yet since my current one ends in December, but I do want to order one now. I will wait though because their website has been a little slow due to everyone being on the site and purchasing planners. I may just end up waiting until late August or early September though. I'm still a little concerned about the interchangeable covers, but I feel better since they did Erin said that they have been testing the covers for a year now. I can't wait for my Conscious Box to arrive. It should ship in the next few days. I wonder what will be in the boxes this time. I hope that I don't get any repeats. I need to come up with a schedule for my blog. I'm hoping to try and post in the morning rather than posting at night. Hello there! 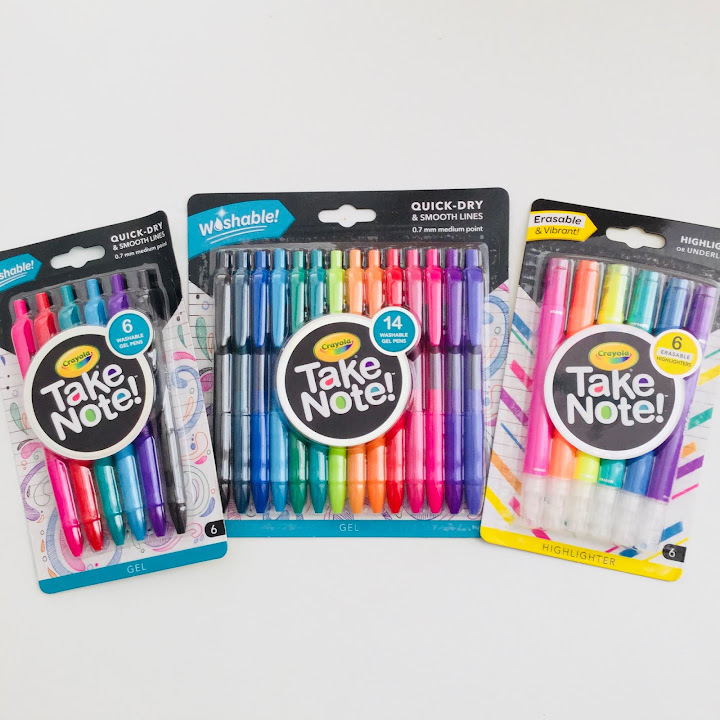 It's Tuesday and you know what that means...it's Currently List time! This is my 8th card that I am posting. Watching: Awkward. I love this show so much. It's really entertaining. Reading: I'm reading my Food Network Magazine that I haven't had a chance to read. I love the recipes that I found and plan on trying some this week. Listening: I have La La La by Naughty Boy feat. Sam Smith on repeat. Love, love, love this song. Making: I'm trying to work on my meal planning and lists. I've been trying to work on following through with my lists. I'll make a list and then end up craving something else that is not on the list. Feeling: I'm feeling content. Today has been a good day. Planning: I'm planning on making some more mini albums (maybe one for 30 Days of Lists). I'm also planning on trying some of the tutorials that I found on Heather Greenwood's blog. Loving: I'm loving all of the tutorials that I found and can't wait to try them. I bought most of the supplies that I need and even though I haven't tried the products yet...I have a feeling that I'm going to love them. Disclosure: This post does contain a referral link. 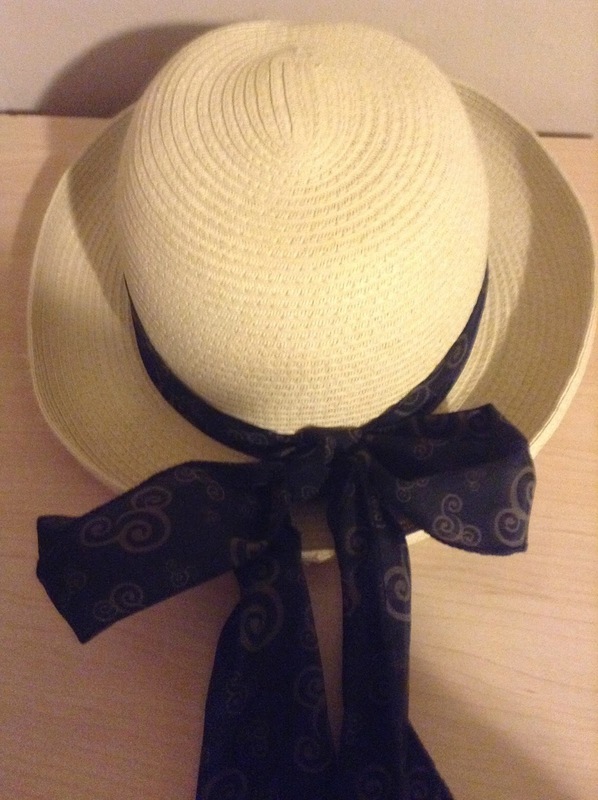 My new hat that I got from Disney World. 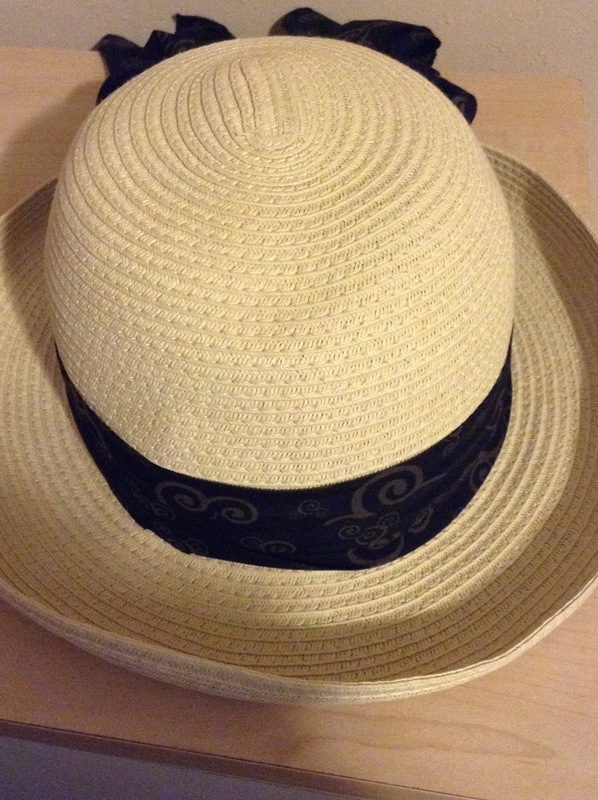 I'm not a hat person at all and basically do not wear them at all. However, I absolutely needed one when we were at Disney last week. It was unbelievably hot and my curly hair just couldn't take the heat (and did I mention it was HOT!). 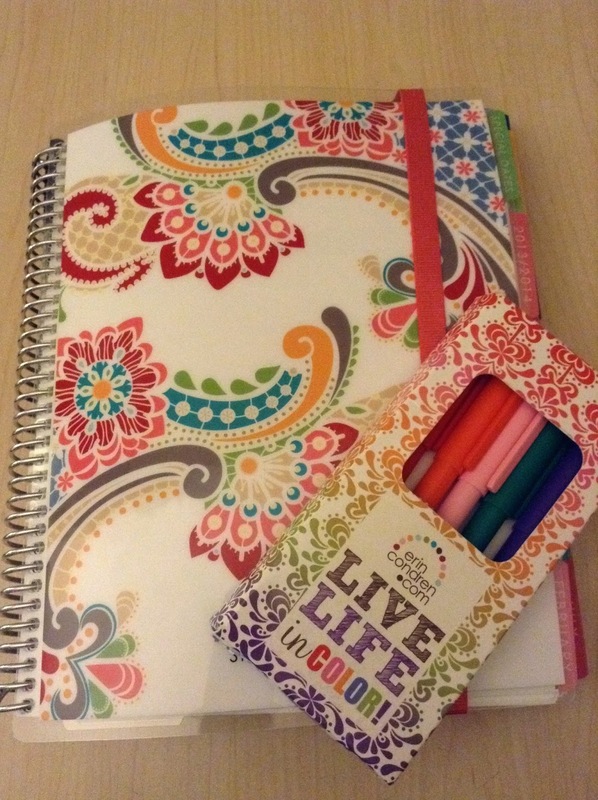 I'm still loving my Erin Condren life planner. I can't wait to order my new one although I am not a fan of the interchangeable covers. They say that they have been testing the covers for an entire year and that there should not be any issues with the covers coming off, but I'm not too entirely convinced yet. However, I will still order one and hopefully there will be no issues with the covers. If you want to try them out you can use this link to get $10 off your first order. I still love my Bath and Body Works Dancing Waters collection. They are actually having an online sale (it ends in a few hours) and I think I need to stock up on some more of the Dancing Waters and Black Amethyst products. Dancing Waters is my absolute favorite and it's a shame that they don't carry it in the stores (they only have hand sanitizer I believe). Hello everyone! I've been gone for about a week and so much has happened. Plus I have a couple of things that I have and want to get done. So I'll try to make it short and sweet. I was gone for a week because we went to Disney World. We had a blast and can't wait to go again. We have so much to do now that we are back...it's amazing how things can pile up after being gone for a week. I can't believe it's June already!!! 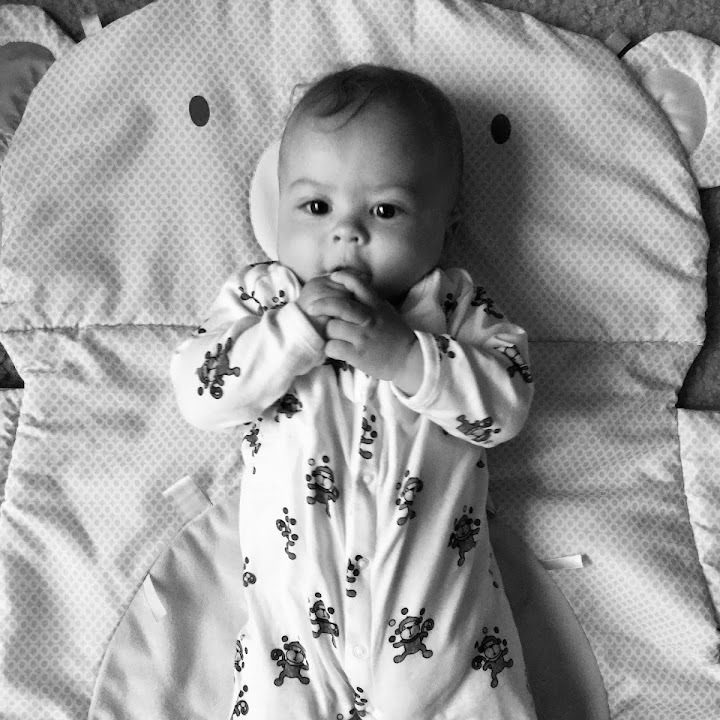 I didn't get to complete the last day in the blog every day in May challenge and I felt kind of bad at first, but at least I blogged every day (even if I didn't follow all of the prompts). We have a lot of catching up to do on shows. I have to catch up on some PL layouts. I have to work on my Disney World mini album and the trip (drive) down to Florida. I finally got some supplies to try a mixed media tutorial using gelatos, gel medium, and stencils by Heather Greenwood Designs. I didn't get to post my usual Tuesday Currently List so I decided to post one today. Watching: I'm catching up on the TV shows that I missed during my vacation. Reading: I'm also catching up on reading on some blog posts by Rukristin, Amanda Rose, and Ramblings of a Suburban Mom. Listening: Listening to Classic by MKTO and other music on the iTunes radio. 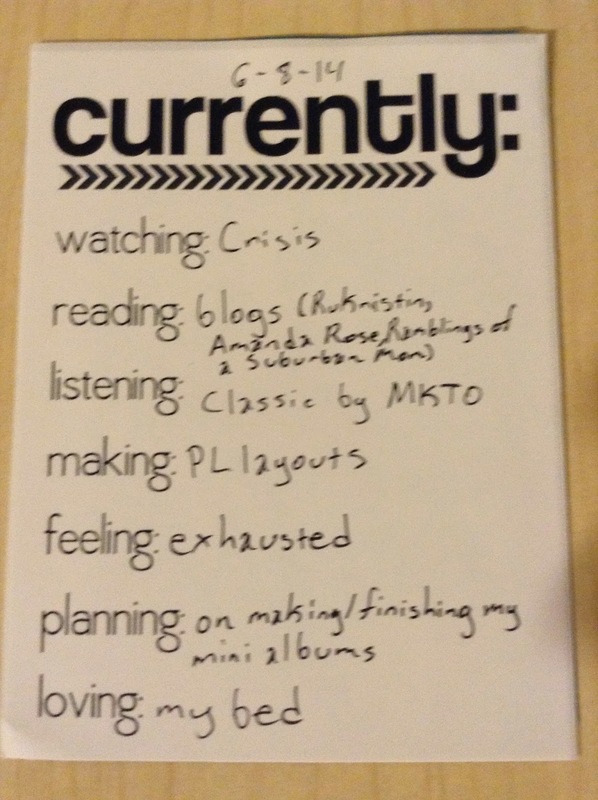 Making: I'm also catching up on my PL layouts. Feeling: The trip has left me and my hubby very exhausted so we have been trying to rest. Planning: I plan to work on my two mini albums in the next few days. Loving: I loved Disney World, but I am absolutely loving my bed right now.